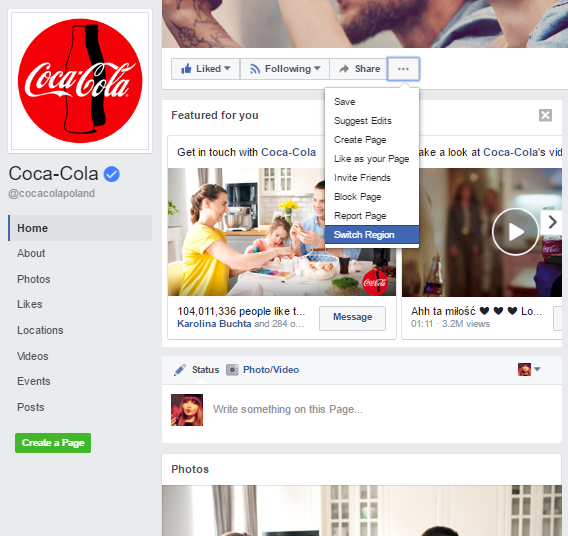 Global Pages were invented with the purpose of simplifying social media presence of global brands on Facebook. Thanks to this feature, it’s easier not only to maintain your brand’s activities, but also to measure the effects and marketing efforts on each market and customize your communication. If you asked any brand what one of their main marketing purposes is, many of them would say “We want to reach internationally.” Nowadays, in the international environment that Facebook provides, working towards such a goal isn’t a problem. So what happens when your brand wants to reach people globally, but they have a different language, different ways of communicating, and are online for different reasons? That’s where Facebook Global Pages comes in. This feature isn’t exactly a novelty, but there are still a number of secrets it hides from users, and it can be a real mystery for some. But we’ve brought all of that into the open with our article below. Migrating to Global Pages might not be the most difficult decision in your life, but it’s still a tough one. It all depends on your resources, strategy, and business goals. If you feel like you can handle it, give it a try. Coca-Cola or McDonald’s could be a good benchmark for your brand – you can easily switch countries and see how they communicate all over the world. It’s easy! Then select desired region and click ‘Save Preferences’. Don’t be afraid – you will be able to switch it back or choose another option! Why is this feature a game changer for many brands? Nowadays, the importance of personalized communication is significantly increasing. The sooner brands become aware of this, the better. Global Pages allow brands to reach & target specified audiences depending on their language or location, without having to set up several Facebook Pages separately for each market. Then you can customize your communication to the language and cultural differences. You can even include current events or news thanks to the localized version of your page. It’s not only about your current audience. Potential new followers will be redirected to the most suitable “version” of the Page. With sticking to just one Page, you can see the metrics of any local versions in one, centralized panel. You get a vanity URL (a single URL for the whole brand) instead of a couple of very similar addresses. There’s no need to set up location or language settings for every single published post. If you already have separate local pages, no problem! You can still gather them all together and create your own Global Page. What fields/industries would benefit from Global Pages? Although this feature is going to be available for every Page or set of Pages, some of them should stay away, at least for a moment. Brands that don’t have global recognition or international reach should not immediately jump to Global Pages. Setting it up and maintaining it is still time-consuming, so be sure it’s worth it. Global brands that offer products and services all over the world (But not every type of service – some should be advertised locally with a separate Page, using ratings and recommendations for each location – e.g. hairdressers). Brands that have different offers in particular countries (e.g. McDonald’s – not only do they offer a range of different products, but they sometimes sell things in one country that wouldn’t be successful in another). Brands that communicate in separate languages, offer unique support (e.g. time zone difference) or have different stores. Root Page – An invisible page that overlooks the whole structure and gives some insights into all of your Global Pages. 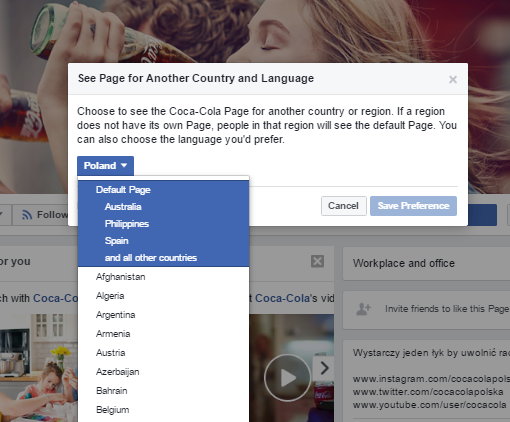 Adding or removing countries and languages is available for the admins of this Page. Market Pages – Location-specific Pages for particular countries, where people meeting specific criteria (being in/from a selected country) are redirected. Default Page – A Page shown to people if they don’t meet any requirements to be directed to any of the Market Pages – e.g. they live or are from a country that has no region-specific Facebook Page, so they need to be directed to this “main” Page instead. How can your brand use this feature? Make the most of what this feature offers, because it can take the personalization of your communication to a brand new level. More customized solutions for Global Pages include a separate Timeline, Cover Photo, photo albums, or apps. Personalize every single detail and please your audience. Culture-specific marketing communication can work wonders. Writing in the right language about something as simple as Christmas wishes will be appreciated. Referring to some cultural events in a particular country can win the hearts of your target group. If you already have multiple Pages, you can still implement this feature by contacting your Facebook account manager – if you don’t have one, you can still get in touch with them by clicking here. Keep an eye on moderation and community management. The fact that you have just one type of page to manage doesn’t mean that you have less work. If you have more personalized communication, it can easily drive attention and engagement, so you might end up with a lot on your plate. There are so many possibilities for those who analyze between competing Market Pages in several countries, helping you find the best and most engaging content. And once you find that, apply it to the Pages of other countries and improve your social media presence. This kind of sharing makes it easier to truly meet your business goals. There are a lot of advantages to be had. Personalized marketing communication is the key to success nowadays, and with Global Pages it is easier than ever. Remember – you can still get new audiences in several countries and different languages using custom targeting options with Audience Optimization. It’s available for your brand’s posts, and it’s turned on automatically if your page has more than 5000 followers; if not, you need to enable it in settings). It still gets you international reach, but in the long run it can be really time-consuming and offers limited customization.